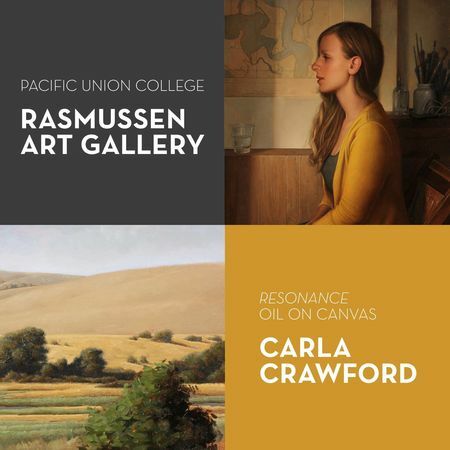 The Rasmussen Art Gallery on the campus of Pacific Union College in Angwin welcomes Carla Crawford as the first visiting artist in the Rasmussen’s 2018-19 season. Crawford holds a double major in art studio and Italian from UC Davis and a teaching degree in art education from San Francisco State University. Her medium of choice being oil paints, visitors to her exhibition in the Rasmussen can expect to enjoy 23 paintings and drawings including portraits, landscapes, interiors, and still lifes. The community is invited to join Crawford for an opening reception of her show, “Resonance,” at 7 p.m. on Saturday, Oct. 13. There will be an artist talk and opportunity to chat with Crawford while enjoying her work. We had the opportunity to speak with Crawford about her experience as an artist, her inspiration, and her aspirations. Tell us about your experience with art education. Well, I completed my undergraduate studies at UC Davis where I studied under the painter Wayne Thiebaud. While I had been painting for years, Dr. Thiebaud introduced me to color theory and composition design for the first time and encouraged me to study abroad through the UC program at the Academy of Art in Bologna, Italy, where I ended up spending two years in exchange, the most formative years of my life. There I was pushed with brutal critiques to work harder than I ever had as a painter. While the Academy in Bologna is a postmodern-leaning school, in Italy I was surrounded by the rich history of Italian painting, something that completely captivated me. I stayed in Italy after graduating, teaching art and art history, but my love of traditional European painting eventually led me to realize I needed to go back to the States to get the classical training I so wanted as a painter. Returning home, I moved to New York City to undertake a course of study at the Grand Central Atelier under the direction of Jacob Collins. For four years I spent 8-11 hours a day in front of the figure and the portrait studying drawing, anatomy, and classical painting techniques. I delved into the work. There was and is so much to learn about painting and in the Atelier I was able to immerse myself in rigorous visual training in tradition of mindful observation I so wanted. This is something I continue to explore in my painting practice in the studio today. Going back even further, when did you first feel the spark of inspiration as an artist? I have loved drawing and painting since I was little. I have always enjoyed working with my hands, and painting is such a physical and tactile activity. The ability of value, color, and texture to create a three-dimensional illusion on a two-dimensional surface has always been interesting to me. What are some of your regular artistic inspirations? I draw my inspiration from the natural world with all of its nuances and variations. As Edouard Manet said, “A painter can say all he wants to with fruits and flowers.” In a culture where we are constantly bombarded with images, I am interested in slowing down and mindfully observing my subject material with all its subtleties until I can really see it. As a painter, my interest is primarily in small scenes of daily intimacy and in the studio I find myself drawn to subjects that capture introspective moments: times of rest, naps, half-eaten food, or the face of a friend absorbed in thought. I work primarily from life which gives me the opportunity to connect in a personal and direct way with my models and subject material. How does your personal history relate to the art you create? I always paint subjects I have a connection to and resonate with me on an emotional level. Often this is my family and friends but also objects and places I find meaningful. My work often centers around themes of intimism and memory. Who are some other artists do you admire, and why? I am inspired by the work of many great naturalists painters but Vermeer continues to be someone I turn to again and again in the studio to understand light, color, and atmosphere in paint. The emotional connection and the empathy he conveys with his models is also something I deeply respect and aspire to in my own work. Tell us about an artistic skill you’d like to learn or improve. Painting is such a complex skill that the painter is never finished studying, the learning is never done, and you never “arrive.” This is one of the reasons why I love it. For me, it is a lifelong pursuit. After years of studying, painting, and teaching I still keep a long list of things I want to understand better and painters with whom I want to study. Currently, I am researching composition design in the studio, something that I believe the painter can devote years of study to. This entry was posted in Campus Events and tagged Carla Crawford, college, Pacific Union College, PUC, Rasmussen Art Gallery by pucadmissions. Bookmark the permalink.